Leslie John Carr came from a noted sporting family. As well as himself, three of his cousins played VFL football – Jack Skinner (38 games for Carlton) Bill Jones (60 games, including two losing Grand Finals for Collingwood) and Marshall Younger (41 games for South Melbourne). 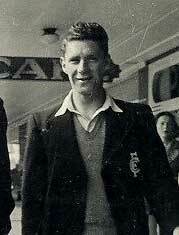 Les's younger brother Jack was also an accomplished athlete who won the 1957 Stawell Gift. Making his senior debut against Melbourne in round 12, Carr played eight consecutive matches through until round 19, when the ladder-leading Blues suffered a 2-point loss to Geelong at Kardinia Park. Then, as the finals loomed, Carlton captain Ern Henfry and star ruckman Ken Hands were welcomed back from injury. Both were automatic inclusions for the Second Semi Final against Essendon, so Les and defender Ron Boys were the two unlucky omissions. A fortnight later, Henfry led the Blues to a celebrated last-gasp victory over the Bombers in the 1947 Grand Final. Despite deep disappointment at missing a place in that Premiership side, Les stayed on at Princes Park for another year. His opportunities were limited however, and his only senior game in 1948 was his last – a five-goal win over Fitzroy at Brunswick St in round 13. At the end of that season he went home to Bacchus Marsh, where he was to enjoy a lengthy career playing for (and later coaching) the neighbouring Darley Magpies. Les wore guernsey number 34 in each of his nine games for the Blues, and the lasting friendships he made with team-mates like ‘Soapy’ Vallence, Bert Deacon and Max Howell led to a long and valued contribution to Carlton’s Past Players Association. A committed Bluebagger to the end, Les passed away on May 11, 2012, aged 82. Marcus Whelan played 173 games for Collingwood in a distinguished career interrupted by military service during World War II. A Collingwood legend, he won the Brownlow Medal in 1939. Contributors to this page: PatsFitztrick , pblue , Jarusa , molsey , Bombasheldon , tmd1 , p(12)terg , keogh , true_blue24 and admin . Page last modified on Thursday 03 of July, 2014 20:29:39 AEST by PatsFitztrick.